First I would like to formally announce that our interscholastic girls team is one of 4 teams in the nation to win a spot in the National Interscholastic Championship in Houston Texas March 18-24, 2019. They are the top 16 high school girls in a country of over 320,000,000 people. None come from polo backgrounds and none had more than a few polo lessons before joining our club since its inception 4 years ago. This is because you believed; you believed in me when I told you that you could play polo and we loved having you involved, that we would take care of your horses as best we could in every situation, that you would improve and we would improve together, and what we had to do to reach our goals. We have tirelessly trudged forward despite long commutes, frustrating practices when we can’t hit the ball, and all sorts of adverse weather. We’ve played through weeks when we win 27-4, then lose 10-28. We moved forward following our mission to be an exemplary and omnipresent community which cultivates team oriented relationships between horse and rider through the sport of polo, hunt seat disciplines, and equine activities. We have and continue to show love, consideration for others, and humility in every interaction. Where we are now where we are going is only possible because of your support and faith. Oftentimes the destination and path is so hard to understand I will only communicate an understandable piece, a next step. Some people may ask why and want more, but often the answers are so complex that they can’t be given. If I told these girls four years ago that if they listened to me they would have the best team in the Northeast and one of four best teams in the nation, it would seem unrealistic. Instead, I said: this is how we will win our first game against Glen Farm, then a next step, and a next. A leader is always making decisions based on such a complex web that there can’t be a full explanation or destination, only faith. If you give me your trust I will give you 10x as much trust, and if you try I will try 10x as hard. Even when it doesn’t seem like I care or I’m listening; I am listening and working towards your success and what you want. As our club grows, it is hard for me to dedicate the same amount of time to each of you but I am always available and I will make the time for you! We are so fortunate to have a coaching and mentorship team which carries forth our values and mission in Kendall, Savanah, Emerson, and all our other staff and volunteers including Rhea, Oliver, and Amy to name a few. Boston Polo Club's motto is “Learn – Compete.” This motto resonates through all aspects of the club. It can be applied to the polo club, the equestrian programs, staff developments, as well as for spectators of our many events and family members of our equestrian enthusiasts. Boston Polo Club was first established as a polo school with the intention of giving the general public the opportunity to learn polo and become better polo players. Even in the active polo players, from youth to adults, Boston Polo's founder Mark Tashjian saw an opportunity to create better quality polo players and members of the equestrian community. This aspect of learning and development includes improving hitting, thoughtfulness and understand of game and team play, and horsemanship. Polo, and all equestrian activities, is very time consuming. Someone who does not understand a field or sport has a hard time appreciating it, so part of Boston Polo Club's mission was, and still is, educating the spectators, significant others, and friends of horse enthusiasts about horsemanship and the sport. This will increase their enthusiasm in supporting their friends, family, and sport as a whole. All too often the horse world is viewed as an expensive, mystical, and antiquated society. Even for equestrians often understanding the difference between leads (horse gates,) why one rider won a jumping class over another, or why a horse is lame or acting odd without any visible signs is baffling. Not only do Boston Polo Club's instructors and staff strive to break down these barriers and help everyone understand all aspects of the horse community, but its culture also produces riders and members who will always go out of their way to share this knowledge and understanding with the greater community. There is nothing more rewarding to our members than sharing this incredible experience and understanding. In addition to educating the public and teaching them about horses - teaching people to play polo, ride horses, and jump horses is our specialty! We love taking someone who has almost no horse experience and helping them learn polo and develop to the point where they can compete on the polo field with players who often have much more time but less quality training. Boston Polo Club merged from a polo school to a polo club by the need to provide a fun and productive environment for students and the polo community to further develop their skills. Unlike other polo clubs in the area steeped in tradition, politics, and hidden costs, Boston Polo Club stays away from all these things to make polo simple, pricing simple, and the traditions simple, to appreciate the equestrian activities and to want to share them with others. As the polo club developed we saw a great need to educate friends, family, and the community about other equestrian disciplines including dressage, hunters, and jumpers, seeing the same barriers to entry and mysticism as in polo. This is what let to the creation of the current Boston Polo Club and Equestrian Center. To further facilitate all these disciplines and our mission we acquired a very unique property which offers ample affordable on site boarding, a polo field, lighted outdoor polo arena, two other multi-discipline lighted outdoor arenas, and an indoor arena for year round diverse operations. We feature competitions on the property and take our participants to competitions off the property to give the full immersion in the equestrian world. Whether someone wants to just stop by to tailgate at a polo match or watch a jumper show, train their horse for polo AND dressage, or just go out trail riding with their friends Boston Polo Club will support you all the way through. If you have any questions about our programs or how to get involved don't hesitate to stop by or call to talk! Congratulations to our Boston team for winning the USPA Northeast Circuit Arena Women's Challenge tournament on January 8th, 2018! There was some tough competition, with Stage Hill coming in second and UMass following close behind. Check out this article featuring our own Amy Gatlin! ​There are two general categories of athletes, those that have natural talent, and those that work tirelessly to get to their desired level of competition. This is true for both human and equine athletes (with polo ponies in mind.) Those with the natural talent without the will and interest and being at the top of their game seldom last long in their athletic careers. Despite their abilities they lose interest and do not have the character needed for a career with both emotional and physical challenges. There are two types of horses that become polo ponies, those bread for polo and those who become polo ponies after a change of career. The majority of polo ponies perhaps, are off the track thoroughbred race horses. Often Thoroughbred race horses are retired between 4 and 8. A small number of thoroughbreds are bred specifically for polo, with some bred, trained, and imported from places such as New Zealand, Ireland, and Argentina. Quarter horses make great arena polo ponies and generally good for 1 chukker on a grass field, but often do not have the same top speed as thoroughbreds and run out of energy on the grass field. There are also a handful of polo ponies that are arabians and other breeds including appendix's (thoroughbred/quarter horse crosses,), and other crosses. 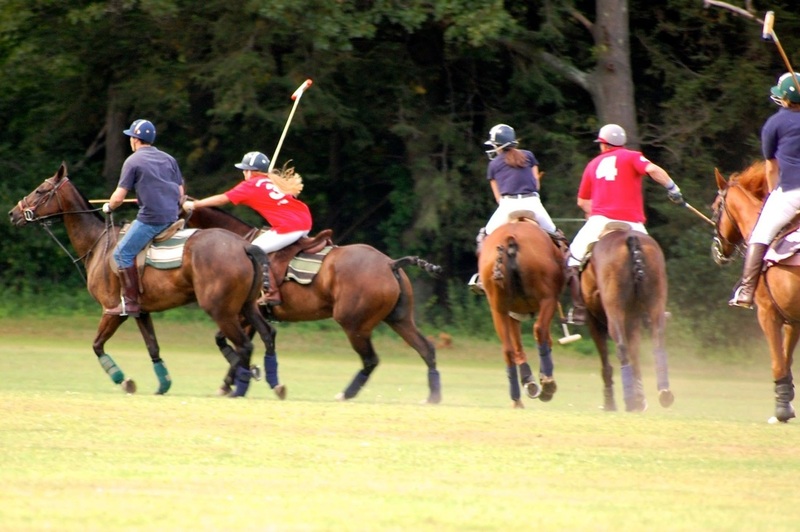 Most polo ponies are mares, or female horses. Geldings have a reputation of being mellow, and mares having characteristics including having an attitude and being more emotional. Geldings can make great polo ponies but the aggressive and strong willed characteristics of mares make them ideal for an intense, hard fought game such as polo. A trained polo pony knows its job very well to the point that they will follow the ball and at times turn as the ball turns, push other horses away from the ball, kick the ball, and attempt to avoid fouls. To train a polo pony takes patience and slow introduction to the game and can take up to a couple years. Most trained polo ponies are 8-20 years old, with some playing into their 20s. Any given year there is at least one polo pony in its 20s playing in the US Open, whereas in most other equestrian disciplines horses at the top level of competition are much younger. Polo is relatively easy on the polo ponies body, with the basic type of work including long distance cardio on a soft grass surface. Most of the polo ponies at Boston Polo Club are thoroughbred mares that are retired race horses bred in the US. At any time there may be one or two geldings that are another bread breed or have other backgrounds (usually quarter horses.) The ideal polo pony is smart and very relaxed and mellow off the field and aggressive on the field, making great horses for other disciplines including jumping, trail horses, and lesson horses. When not playing polo they are the sweetest pets, and when playing polo they know their job is to win and to protect their rider. The opportunity to experience the power and gentleness of a polo pony is one of the greatest things Boston Polo Club has to offer to the community. We welcome anyone during the games or at other times to pet the ponies, try riding them, and build a relationship with them. Owning a polo pony is a very unique relationship, to me a priceless relationship. I often get the question “do the horses like to play polo,” and the question is yes. It is fittig that polo was originally developed as a sport to keep cavalry in shape, because the loyalty of the polo pony is the loyalty any Army would wish to command from its troops. That loyalty is not meant to be taken lightly, and the seriousness of the obligation I make to my horses is unparalleled. I believe polo is a fairly natural past time for a horse: they are running around at great spead chasing the lead horse- just like you see horses do when they are playing with each other. Polo Ponies are very inteligent, and pick up on how the game is played. A good polo pony plays the game for the rider, and I always say that my ponies are better polo players than I will ever be. They follow the ball, try not to follow or step on the ball, and kick the ball at the most opportune moment. It takes a very special bread of human, like horse, to be able to truly develop this relationship. It is one thing to ride a horse, own a horse, or play polo, but it is the true essence of being a man to have these characteristics of trust and respect. If I don't show value, respect, honesty, and open mindadness in my relationship with my Polo Ponies they will let me know. It is one thing to give birth to a child and another to be a father, and it is one thing to own a polo pony and be the owner of a polo pony. This is not just an obligation to my Polo Ponies, but also to my community and family. It is often said that you are like your pet (or your pet is like you,) and I am proud of my horse who all have the utmost integrity. I wish to instill these values and understanding in my students, and my community.